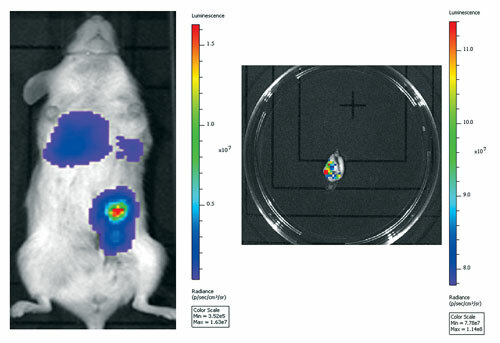 This PET application illustrates the power of imaging in enabling rapid translation of critical information in clinical drug development. Dr. Nguyen emphasized continuing interest in developing new imaging strategies and the next generation of radiotracers. In collaboration with Boston Children’s Hospital, Dr. Nguyen’s team developed novel PET-isotope-labeled antibodies for the detection of Ewing’s sarcoma, and it has a number of other projects in the pipeline. Dr. Cuiffo described a recently developed rodent model of mucositis, a painful dissociation of mucosal membranes, commonly arising from the standard radiation therapy for cancers of the oral cavity. He emphasized the importance of developing combinationmodels that could accommodate both cancer and comorbidities such as those associated with mucositis. Biomodels has special expertise in preclinical modeling of human cancer at orthotopic sites of origin in rodents, using bioluminescent cancer cells. The innovative approach enables visualization of tumor growth in analogous microenvironments in real time. Dr. Cuiffo’s team virally transduces tumor cell lines with luciferase reporter constructs. Next, the cancer cells are implanted at the orthotopic site of immunocompromised mice. IVIS® (Perkin Elmer) in vivo imaging technology is used to follow the fate of the luminescent tumor cells over time. This allows for more precise efficacy studies at otherwise obfuscated internal sites (such as pancreas, brain, or bone) where there is a dire need to develop novel cancer treatments. “Furthermore, in vivo imaging gives us a glimpse into relapse, or dissemination of metastatic cells,” continued Dr. Cuiffo. For example, Biomodels’ new breast cancer models closely mimic clinical situations where the primary tumors are typically resected. Luminescent metastatic tumors are implanted at the orthotopic site in mice, allowed to grow, and resected in survival surgeries. Potential treatments against residual or metastatic disease are then evaluated in real time, visualized by IVIS imaging. The company is also growing research expertise in bone metastases that are notoriously difficult to treat. Dr. Cuiffo is excited to be extending these capabilities to primary patient cells to bring the preclinical models even closer to clinical reality. “We are continuing to evolve our preclinical models of cancer and associated therapeutic toxicities,” he asserts. “Our current generation of preclinical oncology models recapitulate clinical contexts better than ever before, enhancing their predictive potential, and engendering translational success. An NSG mouse with Biomodels’ metastatic bioluminescent triple-negative breast cancer PDX at orthotopic mammary fat pad and mets in vivo at Day 101 and lungs post-sac at Day 137. Dysregulation of blood vessel growth is a hallmark of cancer. An abnormal vascular network creates heterogeneity in blood flow and oxygenation throughout the tumor, thereby reducing efficacy of cancer treatments. To suppress growth of tumor vasculature, researchers have tried using antivascular endothelial growth factor (anti-VEGF) compounds. One such effort, undertaken by the Edwin L. Steele Laboratory for Tumor Biology at the Massachusetts General Hospital Research Institute, led to a startling discovery. Anti-VEGF therapy did not prune tumor vessels sufficiently; on the contrary, it changed tumor vasculature toward a more “normal” phenotype. The Steele Laboratory perfected several sophisticated imaging approaches to pinpoint that optimal moment of blood vessel normalization. One such approach is multiphoton microscopy. It follows fluorescent probes and allows for precise location of labeled protein and cells. A complementary imaging technology, optical frequency domain imaging (OFDI), was established in collaboration with the Wellman Center for Photomedicine. OFDI eschews probes, but it is still capable of deep imaging. It excels at distinguishing morphological features such as abnormal architectures, damaged areas, or imperfect growth. It uses a long-wave laser to measure optical scattering at depths of up to 1,500 micrometer, effectively opening “optical windows” right over the tumor site. OFDI robustly collects images in three dimensions with high processing speeds. A site of interest can be imaged in less than 20 minutes without sampling errors, enabling nearly continuous monitoring of tumor response to treatment. Dr. Fukumura expressed optimism that this discovery will inform the combination regimen comprised of normalizing blood vessels and activation of T-cells by whole cancer cell vaccine therapy. He emphasized that establishing communication between preclinical and clinical imaging is essential for personalizing therapies for each patient. Sophisticated preclinical imaging provides insights in tumor blood vasculature. This knowledge can steer decisions based on data gathered by using conventional clinical imaging such as magnetic resonance imaging. In collaboration with fellow clinicians at Massachusetts General, Dr. Fukumura’s team has been conducting clinical trials aiming to normalize the tumor blood vessels and to use magnetic resonance imaging to determine when the blood flow to tumor is the most optimal to carry therapeutic treatment. Dr. Schnitzer’s lab was the first to develop a delivery strategy based on targeting caveolae, specialized invaginations of plasma membranes. Caveolae transport macromolecules across the endothelial cell monolayer to the underlying cells inside the tissue. Because caveolae disappear in cultured cells, investigators at Dr. Schnitzer’s lab had to isolate caveolae directly from tissue. They used a colloidal solution of silica nanoparticles to coat the surface of blood vessels. Then they purified the caveolae from the fragments of coated luminal endothelial cell plasma membranes. The newest proteomic analysis of caveolae isolated from tumor and normal blood vessels revealed differentially expressed proteins as candidate targets for cancer imaging and therapy. Fluorescence intravital microscopy (IVM) captured rapid and robust uptake of an antibody generated as a specific probe for one of these tumor-induced caveolae targets. The IVM imaging studies in live mice enabled direct visualization and quantification of transport kinetics into solid tumors and helped to validate tannexin, a cleaved form of annexin A1, as a potentially useful drug delivery target. The fluorescent tannexin antibody was pumped across the endothelium, against a significant concentration gradient, to flood the entire tumor. Dr. Schnitzer points out that imaging studies of antitumor agents have only recently made their way into clinical trials. 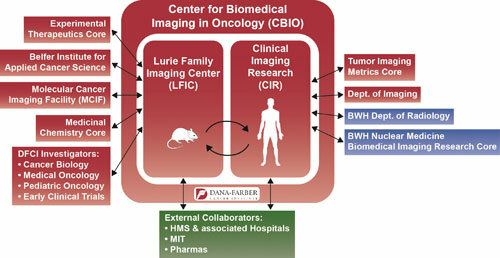 “To date, we underutilize imaging and treat cancer as a black box. Little effort is spent on showing whether the drug actually gets inside the tumor,” he argued. PRISM, however, may buck the trend. It is completing preclinical safety and efficacy studies using novel immunoconjugates with an eye on performing the first human clinical study targeting caveolae as a delivery platform for cancer imaging and therapy. Targeted nanocarriers are actively explored as a delivery system that promises to increase therapeutic efficacy while reducing systemic toxicity. “Trastuzumab conjugated with cytotoxic agents improves therapeutic efficacy against resistant tumors due to the combination’s target specificity and higher cytotoxicity; however, direct conjugation does not improve antibody internalization, and longer time in circulation increases side-effects,” said Sudath Hapuarachchige, Ph.D., a postdoctoral research fellow in the laboratory of Dmitri Artemov, Ph.D., an associate professor of radiology and oncology at Johns Hopkins University School of Medicine. As an alternative drug delivery strategy, Dr. Hapuarachchige describes a novel click-mediated therapy for HER2-positive breast cancer treatment. In this strategy, pretargeting antibodies and drug-loaded nanocarriers are delivered subsequently and allowed to recognize each other by bioorthogonal click reactions. These reactions generate no toxic byproducts and can be performed inside living organisms under physiological conditions without interfering the biological and biochemical processes. Trastuzumab is modified with trans-cyclooctene groups, and a therapeutic nanocarrier is modified with tetrazine. These biocompatible chemical groups readily engage in a highly specific and fast click reaction, resulting in stable cross-linked trastuzumab-nanocarrier clusters. The nanocarrier is a complex chemical product, centered around an albumin molecule to which researchers have attached the anticancer drug paclitaxel and tetrazine groups through polyethylene glycol (PEG) moieties. Multiple functional groups cross-link on the cell surface, promoting rapid internalization, a process that is completed within a few hours. Both antibody and nanocarrier can also be modified with imaging agents, enabling investigators to follow their delivery, internalization, and accumulation in cancer cells. “Two-color fluorescence imaging helped us to optimize the timing of the delivery for both components,” noted Dr. Hapuarachchige. Functionalized trastuzumab was administered first, followed by paclitaxel carriers about 8–12 hours later. In vivo imaging highlighted rapid accumulation of trastuzumab in orthotopic breast tumor. The nanocarrier strongly colocalized with the antibody, but also showed some spread to the liver and other organs, suggesting that more toxicology studies may be required before the drug could be presented to human patients. The team is now focusing on optimization of the two-component delivery system, adjusting parameters such as chemical structures, ratios of the components, and the timing of the delivery. Dr. Hapuarachchige wants to explore translational imaging modalities such as PET/SPECT-CT probes instead of fluorescent groups. By combining diagnostic and therapeutic agents—with each combination constituting a single system—researchers may develop formidable anticancer therapies that would be especially welcome in clinical practice. Scientists at Johns Hopkins are evaluating targeted nanocarriers as a delivery system that could reduce systemic toxicity. The bioorthogonal two-component therapeutic strategy is shown. The strategy proceeds via prelabeling of HER2 receptors by trastuzumab (Tz) antibodies functionalized with trans-cyclooctene, multiple click reactions with drug-loaded albumin (A) nanocarriers functionalized with tetrazine and formation of nanoclusters followed by rapid internalization and drug release. At last month’s TERMIS World Congress in Boston, PreSens Precision Sensing exhibited its VisiSens system, which allows for 2D sensing of O2, pH, and CO2 distribution by combining digital imaging technology with optical sensor technology. According to Gregor Liebsch, Ph.D., head of R&D imaging systems at PreSens, typical samples such as tissues (animal or plant), cell suspensions, sediments, or similar complex biological solutions or gels can be analyzed two dimensionally. Heterogeneous tissue samples can also be evaluated with respect to structural and suspicious changes (cancer), added Dr. Liebsch. One single image contains the information of an array of single point sensors, which essentially creates a map of metabolic activity. Given the 2D sensing of oxygen distribution, it will be much easier to determine the effects of cancer treatment on the growth of the carcinoma, he explained. The system consists of a camera-equipped detection head, control and evaluation software, and a 4×4 cm flexible sensor foil with a spatial resolution of down to 125 µm. The software allows for control of the image-recording process and assists image processing and evaluation. A camera-controlled user interface manages image acquisition and storage. A recent paper by Sanmamed et al. in Cancer Research reports the development of a humanized murine model for analyzing pharmacodynamic and antitumor properties of immunostimulatory monoclonal antibodies. The goal is to satisfy a significant unmet need in cancer immunotherapy research and, in particular, for the assessment of combination therapy approaches. The scientists believe their work is timely, as the number of emerging immunotherapies accelerates, making it impractical to explore all possible combinations in a clinical trial setting. The authors experimented with nivolumab and urelumab, requiring successful infusion and distribution of human lymphocytes expressing hCD137 and hPD1. A positive result was achieved when growth of xenograft tumors of human cancer cell lines was substantially diminished with the application of the combination treatment. A key component of the work was confirming drug action with new multiplexed immunohistochemistry detection reagents (Opal™, PerkinElmer) and a multispectral imaging system (Mantra™ and inForm™, PerkinElmer). FFPE xenograft tissue sections from different time points were labeled for CD3, CD8, CD20, PD1, PD-L1, CD137 in two 3-plex combinations. Immunofluorescence signals were isolated from one another through spectral unmixing. Tumor and stromal regions were identified using trainable pattern recognition. Individual cells were segmented and phenotyped using a new regression classification approach, enabling the accurate identification of cells and characterization of cellular expression and interaction. After drug application, a rise in infiltrating lymphocytes and decrease in regulatory T cells, with a concomitant slowing of tumor growth, were observed. This study not only provides a new murine model to characterize the in vivo effects of immunomodulatory antibodies, but it also provides a framework for in situ immune cell phenotyping assessment by which such models can be evaluated for specific drug actions, in particular those associated with the PD1/PDL1 pathway, according to the researchers.